Tilly was initially rescued from the RSPCA after a large cruelty case where several ponies were left to starve. We heard about her and Tuppence when we bought Bella and Tiffany from a riding school. They had already rescued some of the ponies from this cruelty case but had no more space for any more. Unfortunately as it is so difficult to rehome ponies when they are wild both Tilly and Tuppence were due to be put down. having stayed at a foster home to fatten up we picked her up from the riding school in 2009. Tilly was more confident than Tuppence when she arrived but she was very wild and was difficult to handle, catch, box and pick out her feet. These photos were taken at the riding school when we went to pick Tilly and Tuppence up. As the bottom photo shows The ponies were still very thin on their hind quarters and their thick coats hide the fact their ribs were very easily felt. Tilly has been on loan as a companion for the last two years so she has been handled much more. She arrived back at the home field at the beginning of July a much more confident pony, she had travelled much more comfortably and was confident to be led. She is now much better to handle and to have her feet picked out. As she arrived in a much more confident state we have made the descision to try to break her in. We have started to handle her more and she is starting to learn to lunge. 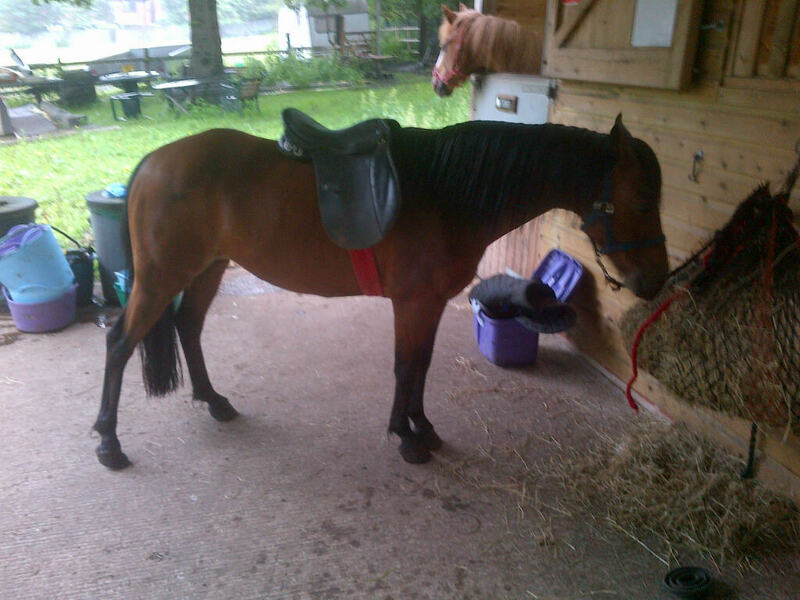 She now wears a saddle and bridle and we hope to break her in this summer. She is a fairly confident character although she is not that experienced so has a lot to learn.